Today we made the drive from St. Louis to Kansas City to make our first visit to Kauffman Stadium. One member of our family was fighting an upset stomach this morning, so we got a later jump than we hoped. As a result, we made it to town around mid-afternoon and headed to the Crown Center, a downtown retail complex. Sunny wanted to check out the Hallmark Center and we took in a few of the local downtown sights before heading to the game. Prior to today, the only time I’d been to Kansas City was in the dead of winter about 15 years ago. We were traveling with some friends and I got to see Kauffman out the window as we drove past on I-70. There are some things I loved about “the K” (the water features in the OF being at the top of the list) and some things I wasn’t too fond of (the parking situation; the 60s era concrete aesthetics) but overall we had a great night at the park. This is a shot Sunny took down near the field prior to the ball game. Thanks to Little League, Joshua and I already had some Royals gear for the game. Don’t worry Cardinal Nation; I still pledge allegiance to the bird on the bat. Last night in St. Louis, Phillie rookie David Buchannan delivered what might be the pitching performance of the Bybee road trip, stymieing the Cards for 7+ innings. Tonight, we might’ve witnessed the best offensive performance we’ll see on the trip from Seattle 2B Robinson Cano. Greeted by a chorus of boos every time he stepped to the plate (it seems Royals fans still haven’t gotten over Billy Butler’s HR Derby snub a few years back), Cano simply raked tonight: an RBI single to put the M’s up 1-0 in the top of the first; a walk in the third; a run-scoring double in the fifth, part of a three-run inning; another walk in the seventh. The guy is just smooth. I know his power has been off this spring, but he does everything so well. It was a treat to see him play tonight. Too bad the Royals couldn’t pull off a come-from-behind victory. One of the best things about tonight’s game was the promotion: $1 hot dogs, peanuts, and cokes. When you’re feeding a small army family of five like we are, every little bit helps. 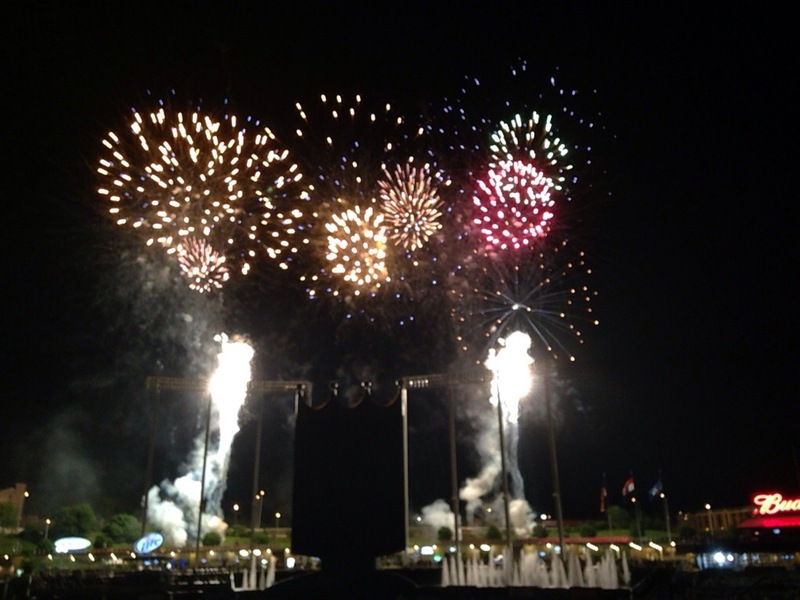 After the game, the Royals put on a fireworks display. If you’ve ever been to Disney, you’ve been ruined when it comes to fireworks. NOBODY does fireworks like Mickey. That being said, the post-game fireworks was probably the best non-Disney fireworks show I’ve ever seen. A great end to a great day. 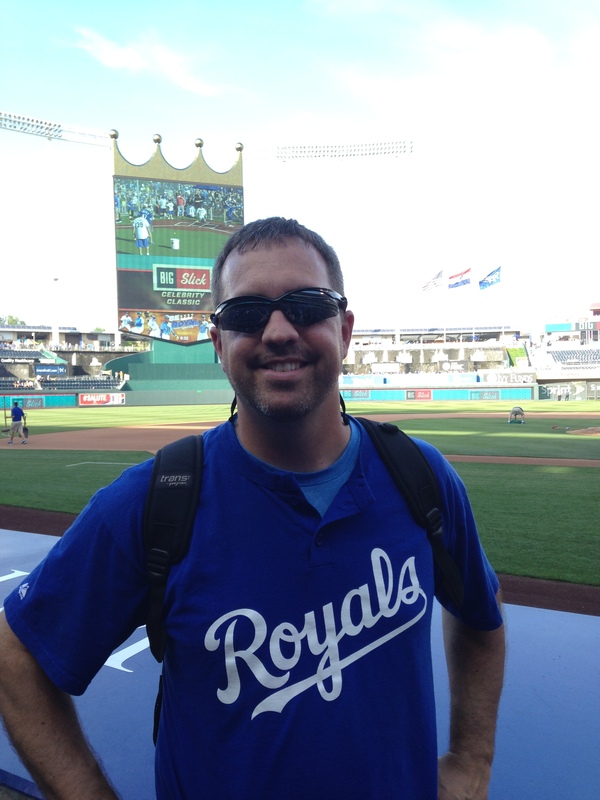 This entry was posted in Baseball, Blessings, Family, Kids, Sports, St. Louis Cardinals and tagged Baseball road trip, Family road trip, Kansas City Royals, MLB, Robinson Cano, Seattle Mariners. Bookmark the permalink. Ha ha! I figured we would probably have to agree to disagree regarding our divergent opinions of El Birdos!